This is the latest special edition by Hewlett-Packard. They collaborated with the renowned designer Vivienne Tam for the second time and created this lovely Mini Netbook. The butterfly design is inspired by "Butterfly Lovers" - a classic Chinese love story. 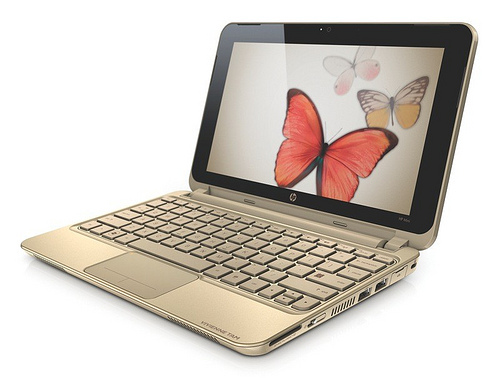 The HP Mini Netbook embodies a digital clutch, which was seen on the runway at NY Fashion Week. It is a part of Tam's spring 2010 collection. As everyone can see, the Netbook looks beautiful with the champagne gold backdrop -but what about the functions and capacity? What are the key benefits? Our opinions will follow soon! the motif is soooo cute ! cant wait for the review ! I love Ur blog ladies! So pretty! It looks like a clutch! If I didn't love my mac so much, I would totally get this...it's so amazing looking.